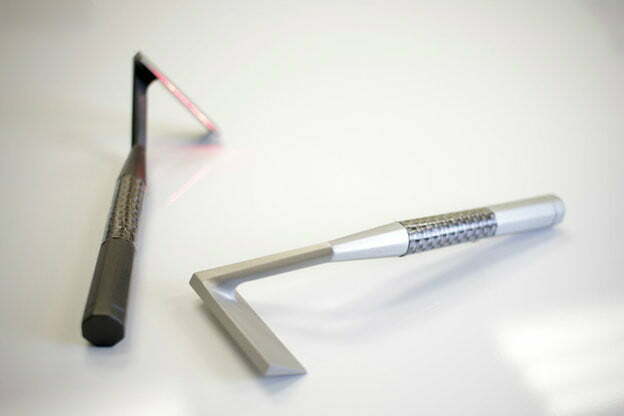 The Skarp laser razor, fully funded on Kickstarter, could do away with disposable razors forever. It uses light to cut unwanted hair, eliminating blades. 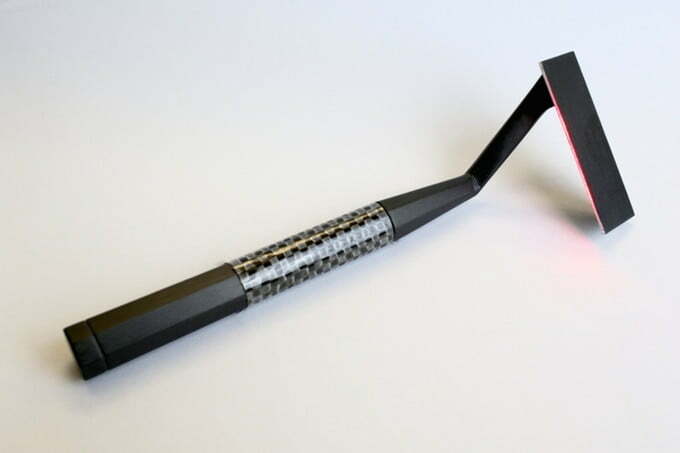 Morgan Gustavsson had the idea for a laser razor back in 2001. The trick was finding a wavelength that applied to every hair type. He attacked the problem with the expertise he gained from thirty years of work with medical and cosmetic lasers. After Paul Binun joined him in 2013, the pair found a particular chromophore that responded to a certain wavelength. This chromophore is a standard characteristic of all human hair — gender or race is not a factor. Yes, this will look awesome in your bathroom, but it’s not just a superficial upgrade from a good ol’ fashioned blade. A laser razor might actually be better for troubled skin. It burns the hairs it passes over, and doesn’t irritate the skin. The hairs are left with a rounded edge at skin level as opposed to the usual sharp pricklies left by a traditional razor. This means a smoother feel with less risk of ingrown hairs, which can be particularly troubling for those with curly hair. Made of 6061 aluminum, both the black and silver prototypes shown have a classic look that makes a nice counterpoint to the future-is-now concept. The mean red line of the laser just screams “Dark Side.” It doesn’t really have the thrill factor of a Sith; it’s considered a Class 1 medical device, which means it’s on a danger level with dental floss. The device can be rinsed under water, though you don’t need water to use it. According to an update on their Kickstarter page September 23, the inventors are considering providing both AAA battery and a non-replaceable but rechargeable battery options to backers. Under normal use, the AAA should last about a month, according to the Skarp Technologies team. The firm reached its $160,000 funding goal in two days, indicating a great deal of interest. Backers are asking a lot of questions, though, and rightly so. One backer brought up concerns about post-inflammation hyperpigmentation sometimes caused by laser hair removal, resulting in an explanation of how Skarp covers 1/100,000 the area while using a fraction of the intensity of the lasers currently used to burn away hair underneath the skin. And there is a related patent on record. Skarp has promised to post a demo on their Kickstarter page, and we’re waiting to see how that turns out. The team explained it won’t be perfect; since they don’t currently have the tech to machine the fiber optics required for the laser to be perfectly straight down to the micron. That’s why they’ve started the campaign, to fund the required mass machining. The Kickstarter campaign will end October 19. As of now the going charge to get a Skarp razor is $140. The Dollar Shave Club guy is probably eating his heart out right now. He’d better get on board because if this Kickstarter delivers, Skarp could change the face of shaving. Get it? Update 10/13/15: Skarp’s Kickstarter campaign has been suspended. Unfortunately, the campaign failed to meet some aspects of Kickstarter’s requirements. For instance, they don’t have a fully working prototype, which Kickstarter requires. In short, a razor with a laser “blade” doesn’t actually exist, and that is a fundamental problem for the big KS, perhaps the most trusted crowd funding site.